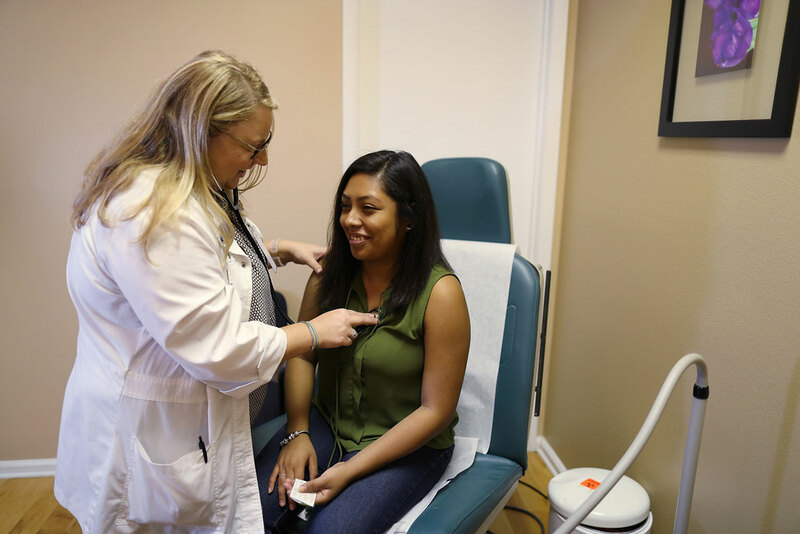 A woman sits for a checkup at a Planned Parenthood health center on June 23, 2017, in West Palm Beach, Florida. This proposal guarantees the right of all Americans to enroll in the same high-quality plan modeled after the Medicare program. In developed countries, health systems that guarantee universal coverage have many variations—no two countries take the exact same approach.5 In England, the National Health Service owns and runs hospitals and employs or contracts with physicians. In Denmark, regions own and run hospitals, but reimburse private physicians and charge substantial coinsurance for dental care and outpatient drugs. In Canada, each province and territory runs a public insurance plan, which most Canadians supplement with private insurance for benefits that are not covered, such as prescription drugs or vision and dental care. In Germany, more than 100 nonprofit insurers, known as “sickness funds,” are payers regulated by a global budget, and about 10 percent of Germans buy private insurance, including from for-profit insurers. Across all of these systems, the share of health spending paid for by individuals out of pocket ranges from 7 percent in France to 12 percent to 15 percent in Canada, Denmark, England, Germany, Norway, and Sweden.6 In short, health systems in developed countries use a mix of public and private payers and are financed by a mix of tax revenue and out-of-pocket spending. Medicare Extra adopts the U.S. Medicare model and incorporates both of the common features of systems in developed countries. The following are detailed legislative specifications for the plan. 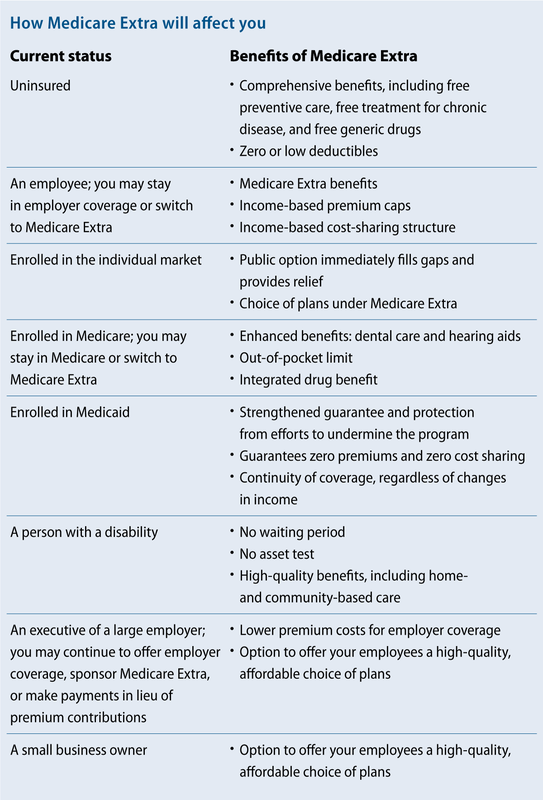 U.S. employers currently provide coverage to 152 million Americans and contribute $485 billion toward premiums each year.13 Surveys indicate that the majority of employees are satisfied with their employer coverage.14 Medicare Extra would account for this satisfaction and preserve employer financing so that the federal government does not unnecessarily absorb this enormous cost. First, employers may choose to continue to sponsor their own coverage. Their coverage would need to provide an actuarial value of at least 80 percent and they would need to contribute at least 70 percent of the premium; the vast majority of employers already exceed these minimums.17 The current tax benefit for premiums for employer-sponsored insurance—which excludes premiums from income that is subject to income and payroll taxes—would continue to apply (as modified below). Fourth, employers may choose to make simpler aggregated payments in lieu of premium contributions. These payments would range from 0 percent to 8 percent of payroll depending on employer size—about what large employers currently spend on health insurance on average.18 The tax benefit for employer-sponsored insurance would not apply to employer payments under this option. When employers choose to offer their own coverage, employees may choose to enroll in Medicare Extra instead.21 At the beginning of open enrollment, employers would notify employees of the availability of Medicare Extra and provide informational resources. If employees do not make a plan selection, employers would automatically enroll them into their own coverage. States would be required to make maintenance-of-effort payments to Medicare Extra equal to the amounts that they currently spend on Medicaid and CHIP.22 For states that did not expand Medicaid, these amounts would be inflated by the growth in gross domestic product (GDP) per person plus 0.7 percentage points.23 For states that did expand Medicaid, these amounts would be inflated by the growth in GDP per person plus 0.2 percentage points. After 10 years of payments, they would then increase by the growth in GDP per person plus 0.7 percentage points for all states. This structure would ensure that no state spends more than they currently spend, while giving a temporary discount to states that expanded their Medicaid programs. Medicare Extra would be financed by a combination of health care savings and tax revenue options. CAP intends to engage an independent third party to conduct modeling simulation to determine how best to set the numerical values of the parameters. Developed countries are able to guarantee universal coverage while spending much less than the United States because their systems use leverage to constrain prices. In the United States, adopting Medicare’s pricing structure—even at levels that restrain prices by less than European systems—is an essential part of financing universal coverage. Extensive research recently has shown that variation in prices charged by medical providers is the main driver of health care costs for commercial insurance.24 Hospital systems in particular can act as a monopoly, dictating prices in areas where there is little competition. Excessive prices are not a major issue for Medicare because it has leverage to set prices administratively. To lower both the level and growth of health care costs, provider payment rates under Medicare Extra would reference current Medicare rates. Currently, Medicaid rates are lower than Medicare rates, and both are significantly lower than commercial insurance rates.25 Medicare Extra rates would be lower than current commercial rates in noncompetitive areas where hospitals reap windfalls, but higher than current Medicaid and Medicare rates. Medicare Extra rates would reflect an average of rates under Medicare, Medicaid, and commercial insurance—minus a percentage. For illustrative purposes, CAP estimates that if Medicare Extra rates are 100 percent of Medicare rates for physicians and 120 percent of Medicare rates for hospitals, the rates would be roughly 10 percentage points lower than the current average rate across payers.26 For rural hospitals, these rates would be increased as necessary to ensure that they do not result in negative margins. Medicare Extra would negotiate prices for prescription drugs, medical devices, and durable medical equipment. To aid the negotiations, multiple nonprofit, independent evaluators would vet data submitted by manufacturers, conduct studies, and make periodic value assessments. If negotiated prices are within the range of prices recommended by all evaluators, Medicare Extra would include the product on a preferred tier with limited cost sharing. If prices for existing products rise faster than inflation, manufacturers would pay rebates on products covered under Medicare Extra—just as they do under the current Medicaid program. Medicare Extra would reform the payment and delivery system to reward high-quality care. Medicare Extra would pay hospitals for a bundle of services, including associated care for 90 days after discharge. The objective of this reform is to reduce variation in post-acute care, which is the main driver of health care costs under Medicare.30 Medicare Extra would phase in this reform over three years until it applies to half of spending on hospital admissions. Medicare Extra would make “site-neutral” payments—the same payment for the same service, regardless of whether it occurs at a hospital or physician office.31 The current Medicare program pays hospitals far more than it pays freestanding physician offices for physician office visits. Not only is this excess payment wasteful, it provides a strong incentive for hospitals to acquire physician offices—aggregating market power that drives up prices for commercial insurance. Excessive administrative costs are a key reason why health care costs are so much higher in the United States compared to other developed countries.32 Medicare Extra would take advantage of the current Medicare program’s low administrative costs, which are far lower than the administrative costs of private insurance.33 In particular, the cost and burden to physicians of administering multiple payment rates for multiple programs and payers would be greatly reduced. The American people have many major unmet needs. Medicare Extra is carefully designed to leverage existing financing by states and employers and extract maximum savings so that the program would not consume all potential sources of tax revenue. Some combination of the following tax revenue options would be sufficient to finance the remaining cost of Medicare Extra. The recently enacted Tax Cut and Jobs Act (TCJA) lowered the corporate tax rate from 35 percent to 21 percent and enacted several other tax cuts skewed toward the wealthy. As part of a broader effort to replace the tax bill, some of the revenue could help finance Medicare Extra. Medicare Extra would be financed in part by taxes on high-income individuals. One option would be a surtax on adjusted gross income—including capital gains—on very high-income individuals. CAP’s modeling will determine the exact parameters of the surtax, including the rate. In addition, under current law, large accumulations of wealth are never subject to capital gains taxes if held until death and transferred to heirs. One option would be to eliminate this stepped-up basis so that large accumulations of wealth cannot avoid capital gains tax. Medicare Extra would also be financed in part by increasing health care taxes and curtailing health care tax breaks. For high-earners—singles with income above $200,000 and couples with income above $250,000—the additional Medicare payroll tax and the Medicare net investment income tax (NIIT) could be increased. In addition, all business income of high-income taxpayers—including S corporation shareholders, limited partners, and members of limited liability companies—could be subject to the Medicare tax either through self-employment taxes or the NIIT. The tax benefit from the exclusion for employer-sponsored insurance would be capped at 28 percent. In addition, lower premiums for employer-sponsored insurance would significantly reduce this tax expenditure. Medicare Extra would also obviate the need for tax benefits for flexible spending accounts and health savings accounts. Lastly, Medicare Extra would be financed in part through public health excise taxes. The federal excise tax on cigarettes would be increased by 50 cents per pack and adjusted for inflation. A tax could also be imposed on sugared drinks equal to 1 cent per ounce. These taxes would reduce health care spending, helping to offset the cost of Medicare Extra. Medicare Extra for All would guarantee the right of all Americans to enroll in the same high-quality plan, modeled after the highly popular Medicare program. It would eliminate underinsurance, with zero or low deductibles, free preventive care, free treatment for chronic disease, and free generic drugs. It would provide additional security to individuals with disabilities, strengthen Medicaid’s guarantee, improve benefits for seniors, and give small businesses an affordable option. At the same time, enrollees would have a choice of plans, and employer coverage would be preserved for millions of Americans who are satisfied with it. Our society will be judged by how it treats the sickest and the most vulnerable among us. Health care is a right, not a privilege, because our positions in life are influenced a great deal by circumstances at birth; and beyond birth, the lottery of life is unpredictable and outside of one’s control. America, the most powerful and wealthiest nation in the history of civilization, has endured a long journey spanning decades to fulfill these principles. The country has slowly added step upon step toward universal health coverage. The ACA was a giant step, and the sustained political fight over the law showed that the American people want to expand coverage, not repeal it. It is now time to guarantee universal coverage and health security for all Americans.